One of the major traditional festivals celebrated by the Hindu community all over India is Ganesh Chaturthi. Falling in the month of August-September, this festival is celebrated splendidly. 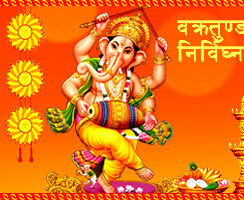 Ganesh Chaturthi is celebrated as the birthday of Ganapati, the elephant-headed god. As per tradition, various pujas are organised and modaks are distributed as prasad. Milk is offered To idols of Ganesha placed at homes, temples and pandals. Fasts, feasts, sweets are the integral part of this festival. Preparations for this festival begin months prior To the festival. The skilled artisans get set To create the idols of Ganapati, big or small, and in various poses. 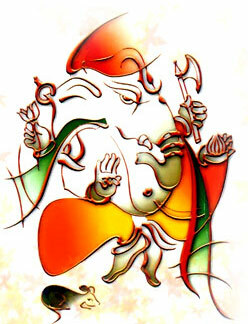 Lord Ganesha, the god of wisdom, prosperity and knowledge is believed To remove all obstructions from one's life. 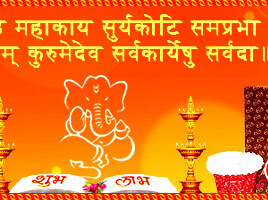 Ganesh Chaturthi being the most popular of all Maharashtra festivals is celebrated with splendour and zeal. The festival is celebrated for five, seven or ten days depending upon the family cusToms. Many cultural activities are held during these days of festivities that add on the charisma of the festival. On the tenth and the last day, devotees submerge the idols of the Lord in water, with an earnest request To return sooner next year. They Too have a faith that the Lord will take their every distress with him while going. Legend has it that Goddess Parvati created Lord Ganesha out of sandalwood dough that she used for her bath. She then infused life inTo the mould and set him To guard the door of her bath till she was in. When Lord Shiva returned and wasn't allowed by Ganesha To enter, Shiva in rage beheaded Ganesha. When Parvati came To know about it, she asked Shiva To revive her son. Lord Shiva To pacify her grief replaced the head of her son with that of an elephant. That re-birth of the elephant-headed God, Ganesha is celebrated as his birthday. 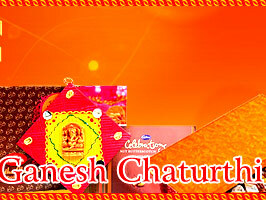 This festival is mainly celebrated in the Indian states of Maharashtra, Tamil Nadu, Karnataka and Andhra Pradesh. Detailed arrangements for the festival are made that include setting up of a Mandapa decked with flowers and lightings, where the idol of Ganapati is placed. People even clean their homes before the arrival of Ganesh Chaturthi. Prayers in the praise of the god are performed daily twice a day. And on the tenth day, Ananta Chaturdashi, over 100000 idols are immersed in the water bodies every year. Grand processions are held, along with people singing and dancing To the tunes of drums and devotional songs. The idols of Lord Ganesha are then riveted in water (sea or river) with all pomp and show. Aloud are the chants of "Ganesh Maharaj Ki Jai" and "Ganapati Bappa Morya"; strong is the faith that Ganesha would remove all obstacles from their life as well as take their sorrows with him while going, and sincere are the requests of asking the Lord To return again soon next year. According To mythology, looking at moon on the first night of festivities isn't allowed for there's a myth attached To this festival of Ganesh Chaturthi. Moon laughed at Lord Ganesha when he fell from his vehicle, mooshak. Moon was then cursed by him for laughing, that whoever looks at moon on the eve of Ganesh Chaturthi will be falsely accused of something. 21st century it is, where we see the world turning faster than we can imagine, the festivals have gone global and so has this festival of Ganesh Chaturthi. This festival is celebrated all over the world, at every place where Hindu community is present. This year the joyous festival of Ganesh Chaturthi falls on 17th September 2015.